Pho­tog­ra­phy pod­cast #77 fea­tures an inter­view with Dar­win Wiggett where we talk about neu­tral den­sity fil­ters and grad­u­ated neu­tral den­sity fil­ters. Dar­win explains why we use these fil­ters and how to use these fil­ters effec­tively. We dis­cuss hard edge ver­sus soft edge, phys­i­cal ver­sus soft­ware fil­ters, we even talk about reverse grad­u­ated neu­tral den­sity fil­ters. For new­bie pho­tog­ra­phers that have just hatched, Dar­win goes over polar­iz­ing fil­ters as well. Left — Tire with Polar­izer and-2-stop-hard-grad. Right — Tire with a Polar­iz­ing fil­ter plus a 2-stop-hard-edge grad and-a 5-stop solid-ND fil­ter. 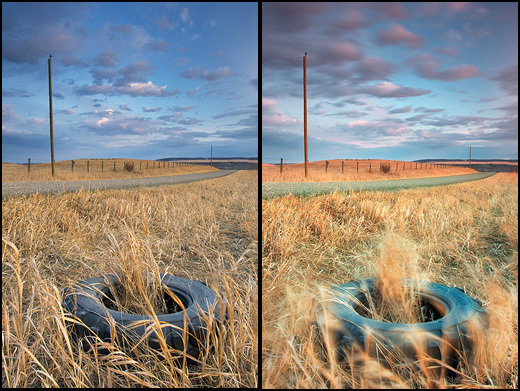 Note the move­ment of the fore­ground brush and the soft­ness in the clouds. 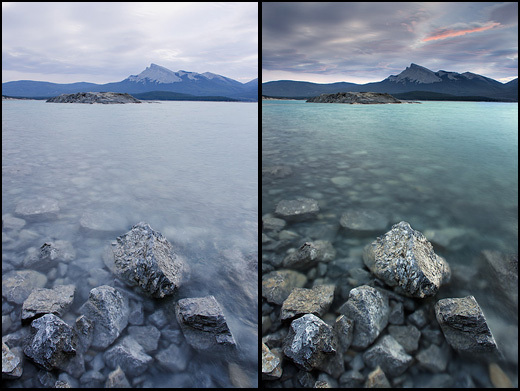 This was achieved by using the solid ND fil­ter to get a slow shut­ter speed. ‚© Dar­win Wiggett. Thanks to jack­la­bel, AcadieLi­bre and Mars observer who posted a blog com­ment about our last pod­cast. Thanks as always to every­one that sent com­ments by email about our last pod­cast. Although ALL com­ments are appre­ci­ated, com­ment­ing directly in this blog is pre­ferred. Thanks as well to all the new mem­bers of the bul­letin board.